This article is about the guest star. For the character, see Pierce Brosnan (character). 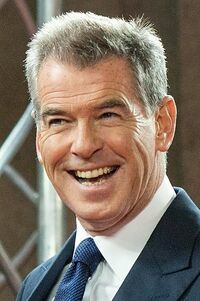 Pierce Brendan Brosnan, OBE (born May 16, 1953) is an Irish-American actor, environmentalist, and film producer. He voiced the Ultrahouse 3000's "Pierce Brosnan" voice option and himself in the season 13 episode "Treehouse of Horror XII".